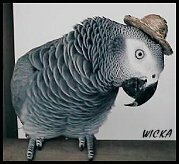 This is my female Congo African Grey, WICKA. 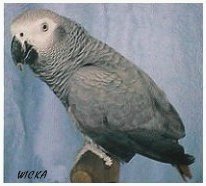 Hatched Jan. 23, 1996, she's my youngest Grey and the clown of my bird family. She does the silliest things, like laying on her back in her food bowl and placing her toys in her water bowl every night before she goes to sleep. She started talking at the early age of 4 months. 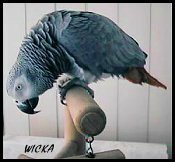 One of her first words was "Wicka"... and that's how she got her name. There's no way she had ever heard that word before, so we assume she just made it up! As you can see, she loves to wear her little hats. 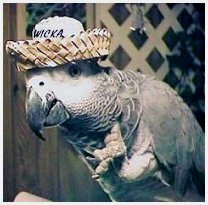 I found this out quite by accident one day when I was playing with her and I put a pill bottle cap on her head. She didn't move for 5 minutes because she didn't want it to fall off! So, of course, I bought her her own little hat collection. Now, whenever I show her one of her hats, she sits up straight and very still so I can put it on her head. You'll notice that while she's wearing her beautiful hats, she sometimes lifts her foot up to the side of her head and wiggles her toes. 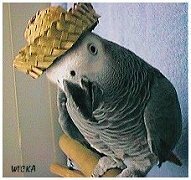 African greys have a reputation for being the best talkers of all the parrot species. This is a well earned distinction. 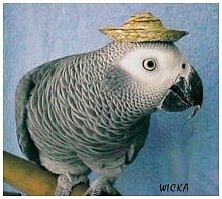 Most African Greys have very large vocabularies as well as a penchant for mimicking various household sounds. 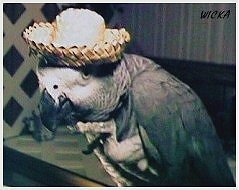 With a Grey around, you can never be quite sure if your phone is really ringing or if your parrot is just having a bit of fun with you! 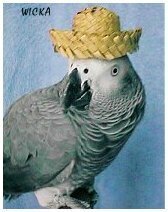 Greys are not the most colorful of parrots. 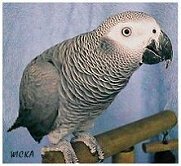 They are basically a dark grey with varying shades of lighter grey/silver/white and, their most colorful feature, a bright red tail. Though they can't be called "spectacular", they do have a noble kind of beauty that's breath-taking. Timneh African Greys are slightly less colorful than the Congos. They are a bit darker grey with a darkish maroon tail. Timnehs are smaller in size as well, and have a light "pinkish" colored upper mandible. 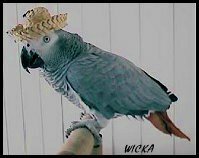 Congos have an all black beak. Congos and Timnehs are fairly equal in talking ability and disposition. Although MOST Greys don't start talking until around one year of age, there are always exceptions. These parrots are generally on the shy side. They tend not to be outgoing when strangers are around and often will not talk in front of people who are unfamiliar to them. They are also somewhat clumsy and nervous natured. Regardless of these "shortcomings", they make wonderful, affectionate pets. They can live into their 60's with proper care and diet.